We have received notice from Gloucestershire County Council of road closures in the area over the coming weeks. Part of a larger program of ‘Streetworks’, scheme No: 813765 is for the total resurfacing of Barrington Road from the junction of Rissington Road and Barrington Road in the north down to the southern entrance of Mitchell Way adjacent to the start of the airfield and onwards towards the Barringtons. The scheduled dates are now 18th – 22nd March with appropriate diversions. The dates are provisional, subject to weather and completing earlier scheduled works. This will be a total road closure, and more details will be provided nearer the time. For more details and FAQ about the County Council’s resurfacing programme, please visit: www.gloucestershire.gov.uk/highways/roads/county-resurfacing-works/. In the meantime, the partial road closure of approximately 1,000m of Wyck Rissington Road continues from 7th January to 22nd March or until the works are complete. The reason for the closure is to replace water mains and associated fittings and services. A formal “arrowed” priority system on Chipping Bridge, which carries B4450 Station Road over river Evenlode, on the border of Oxfordshire and Gloucestershire, is being introduced. This work is required as the bridge is already too narrow to allow safe two-way traffic flow and as the edges of the bridge are substandard. The temporary narrowing will be implemented by installing temporary barriers and signage as well as white lining works. Unfortunately, as the carriageway is very narrow at this location, it is necessary for B4450 Station Road to be closed between Old Burford Road and Kingham Train Station, for the safety of both the workforce and the travelling public. 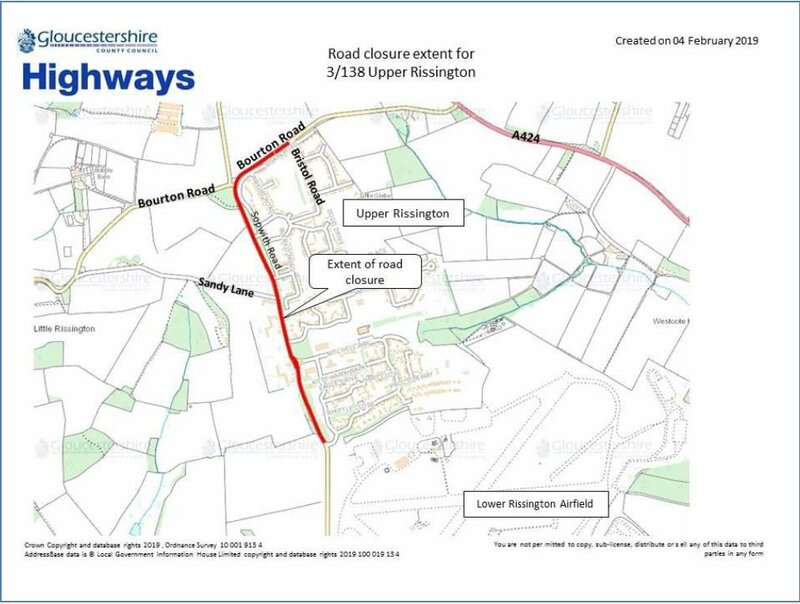 A signed vehicle diversion route will be in place for the duration of works and extents of the closure together with the official diversion route are shown on the drawing, which is attached to this email. 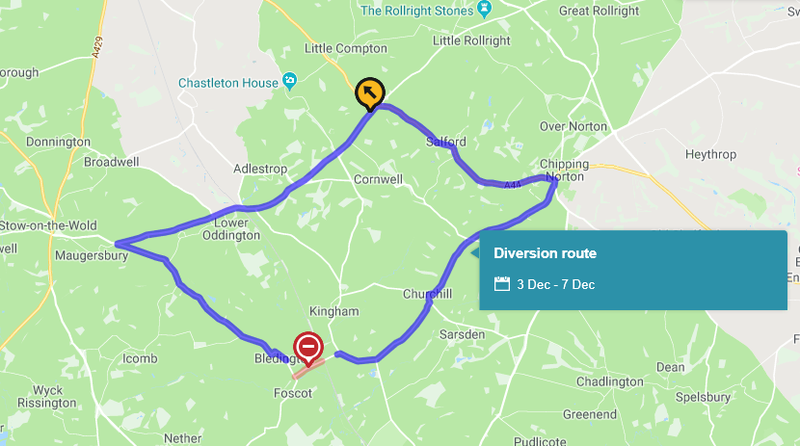 A full three-day closure that will operate between 09:30AM on 5th December and 16:30PM on 7th December will be required to complete the works. Access for pedestrians and dismounted cyclists over the bridge will be maintained throughout the works. Vehicular access to residential properties and businesses on Station Road will be maintained, accessed from each end of the closed section. Reconstruction of the bridge deck, which will incorporate a permanent road narrowing, is currently programmed for 2020/21. This delay will allow us to evaluate the priority system performance before permanent measures will be adopted.